I protested against the Iraq war ten years ago, but as always with my sceptical tendencies and my need to have a worked-out, informed position, I had qualms about simply joining the anti-war crowd. Getting rid of Saddam would surely be a good thing, but that wasn’t the motive of the US administration. They were talking about WMD and trying to make a connection – quite ludicrously – between Iraq and September 11. And they were clearly bullying the UN reps who were reporting no hint of WMD, and the UN Security Council nations who opposed war. What’s more, the US push had little to do with humanitarianism, and much to do with the restoration of national pride after a fall, an absolutely appalling reason for a militarily mighty nation to declare war on a much smaller one. The outcome was a foregone conclusion and the cost to the Iraqi people would surely be enormous. But that was my dilemma. Saddam’s dictatorship was obviously hurting the Iraqi people, though some more than others (and I didn’t really know too much about the ethnic, regional, economic and religious differences within the country and how they aligned with Saddam). Could an intervention manage to topple Saddam as bloodlessly as possible, and replace him with something more generally liberating for the Iraqi people? I thought not, even with the most meticulous international planning. And of course, there’s no such thing as meticulous international planning, and I hold little hope that there ever will be. So, though, I believe in the, probably hopelessly idealistic, humanistic notion of humanitarian intervention to rid any nation or region of oppressive government, and though I have little respect for the notion of the inviolability of national sovereignty, being humanistically anti-nationalist, I recognised pretty clearly that the planned invasion of Iraq would do more harm than good. Of course I didn’t recognise at the time just how much harm it would do. It was an assessment that confirmed my suspicions, but of course somewhat lacking in detail, and for all I know quite incorrect. So let’s have a bit more of a look-see. I’ll base much of what I write here on the three-hour BBC documentary aired recently. That documentary starts with Bush’s simple-minded post-September 11 us-and-them pronouncement, ‘you’re either with us or with the terrorists’, and then takes us to communications between the US and Iraqi governments. The US was demanding a complete falling-in-line with their position, it appears. They were asking, ‘are you going to fully co-operate with us against al-Qa’ida?’ Saddam’s response, according to an Iraqi intelligence agent, was ‘America isn’t the only country to suffer terrorism. The sanctions on Iraq are also terrorism.’ He also said that these sanctions had killed far more people in Iraq than died in the US on September 11. He may well have been right, but he conveniently omitted his own role in bringing those sanctions about, and I’ve no doubt that he would’ve manipulated the sanctions and their impact for his own propaganda purposes. The point is that his response to the US administration wasn’t grovelling enough, and the Bush team used this as an excuse to target him. Ten years later, some 170,000 Iraqis are dead (the figures are of course notoriously rubbery) and their families devastated, Baghdad remains a hell-hole, and the current Prime Minister Nouri al-Maliki, a Shia, has assumed quasi-dictatorial powers and has been acting against the Sunni minority, within his own government and within the country, in order to suppress sectarian violence. This hasn’t been hugely successful, and I think it’s fair to say that the Iraq of today is neither peaceful nor particularly democratic, though earlier this year Maliki’s opponents managed to get a law passed banning him from seeking a third term in office. Maliki has been PM since 2006, having been re-elected in 2010. So what was it all for? The war brought al-Qa’ida into Iraq, where it hadn’t been before. It unleashed terrible sectarian forces within the country, as well as creating huge anti-US and anti-western resentment. You could say it has led to an uncertain Iraqi future, but that would be unfair, since that was also the situation under Saddam. The war would have cost the US a fortune, though I’m sure that many Americans ripped their own fortunes out of the Iraqi economy during that time. About 4,500 US soldiers were killed during the invasion and occupation, and none of their objectives have been met. 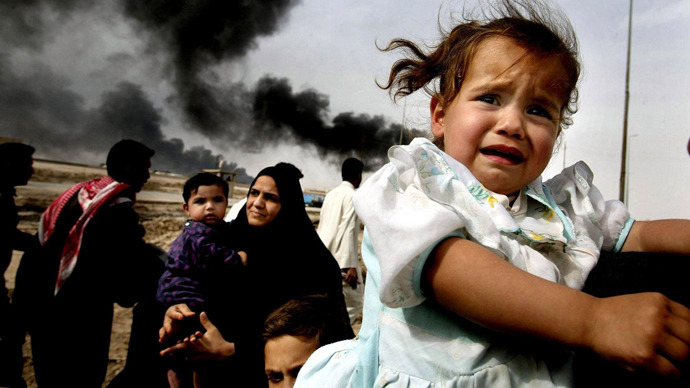 The world is not safer because of it, quite obviously, and Iraqis are certainly not safer for it. The main lesson to be learned from it is a lesson that never does get learned – don’t intervene in a nation’s affairs (or a region’s affairs) unless you’re sure that the outcome won’t be worse than the situation that caused you to intervene. As I wrote that last sentence I realized that this is something you can never know for sure, and could therefore be used as an excuse for never intervening anywhere, but generally you can have a good idea, and you can plan for an outcome. In fact, it’s highly irresponsible not to, especially when human lives are at stake. The Bush administration seems to have had very little interest in the outcome of its intervention. Was it interested in establishing a democracy in Iraq? Seriously? Could it possibly be so utterly devoid of realism? It seems to me obvious that it had never given the outcome that much thought. The intervention in Iraq was, as I’ve said, about restoring US prestige after September 11. Invading Afghanistan and ousting the Taliban (or half-ousting them) wasn’t enough of a muscle-flexer, something had to be done on a bigger stage. The Iraqi people, if they were ever considered at all, were treated as if they would be just like Americans. They’d all hate living under a dictatorship, they’d all embrace democracy whenever they got the chance – maybe they’d even become a new Christian outpost in the Middle East. As for the Sunni-Shia problem, the Kurdish problem and all the other sectarian issues, the lack of secular political institutions, the absence of any real history of democracy and so forth, all of these were barely considered. It was irresponsibility on a massive scale, but the question is – was it criminal? Listening to Tony Blair talking in the documentary about – and this is a direct quote – having ‘taken the view that we needed to remake the Middle East’, as if it was a piece of plasticine, shows breathtaking naivete, hubris and insensitivity (think of who the ‘we’ is here), but on the face of it, it hardly sounds criminal. After all, Blair is a ‘good guy’, unlike the bad guys of al-Qa’ida. He’s not out to kill as many infidels as possible so as to be a hero to his people. He genuinely wanted to help the Iraqi people, I’m sure, but in doing so he chose to minimise their nature, or to recast them, essentially, as western liberal democrats. I’m sure that he would argue that he wasn’t under-estimating the task, but the fact is, that’s exactly what he was doing. Underestimating the task and the cost to the – completely unconsulted – inhabitants of the region. Heads of state, especially of powerful states, have an enormous responsibility, which carries with it extra accountability. History is an account of heads of state, from Alexander the Great to Genghis Khan to Adolph Hitler, using their power to conquer or reshape massive, and massively populated regions of the world, with little regard for the local inhabitants. In earlier times, this was just the way of the world – if you and your family were in the way of the Viking or Mongol or Nazi invaders, bad luck. But times have changed, and we now have terms like genocide, crimes against humanity, and ethnic cleansing, to consider, and we have – admittedly fledgling – institutions such as the International Criminal Court, to render justice to those ‘inconvenienced’ by the mayhem involved in the remaking or reshaping of particular regions of the globe. Iraq has been pretty well wrecked by the needless intervention of western powers in the last ten years. I would say that 200,000 avoidable deaths would be a conservative estimate, and that’s just the pointy end of the mess. Possibly as many as 2 million have been displaced. Nobody has been held accountable and western leaders are still telling bare-faced lies about the impact of the invasion. Just last month the death toll from fighting in Iraq was 1,057 – the biggest monthly death toll in 5 years. The descent into civil war looks inevitable. The most powerful countries don’t want a bar of the ICC, they prefer to have a free hand for their reshaping and remaking, but if the behaviour of the decision-makers who created this bloody debacle isn’t criminal, I can only scratch my head and wonder what the word ‘criminal’ actually means.